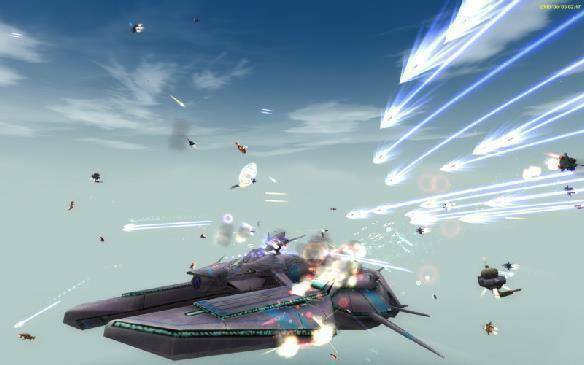 In Air Rivals players get to pilot their very own fighters (known commonly as Gears) in this futuristic action packed free to play MMO space shooter with lush 3-D graphics. Set in the distant future on the planet Philon, players can fly there Gear across beautiful landscapes, chasing down enemies through treacherous canyons and icy caves, up over snowcapped mountain peaks and through the wild jungles, a huge array of atmospheric locations out there to be discovered. Equip your Gear and customise it to your own personal preferences, as you improve your flying abilities take part in daring duels against other players, competing against players from your own nation or in battles against rivals from different servers. Choose between two mighty nations; the imperialist Bygeniou (BCU) or the rebels of Arlington (ANI) as you battle for fame, respect and fortune. Complete missions for your chosen faction and unlock new technology including superior weapons to give you that much needed advantage in battle. Create powerful formations with other players as you head into battle against your enemies, established a brigade of 30 or more players and battle your way to the top of the ranking ladder, and even claim the top spot by running for president and becoming your nation’s leader. Choose between different types of Gears, each having a different specialisation with its own strengths and weaknesses when compared against its peer ships. The A-Gear is able to land on the surface and drive, using its Siege Mode ability the gear turns itself into an anti-aircraft turret, ideal for taking down enemy I-Gears; with their fast speed and high damage they can be a major bane for your allied flying Gears. The B-Gear is able to do huge amounts of damage in one single attack and specialises in Ground Bombing and Air Bombing abilities, a huge difference between the more support and buff orientated M-Gear with its high defences and unique Reverse Engine ability. Players are able to equip their gears with a number of different weapons and accessories to turn them into ships that better suit their style of play. Epic boss items are available, dropped only from specific boss creatures, which drop armour sets and weapons, alternatively players can do gather resources and recipes to craft their own items, anything from weapons, shields and more.